Premium Compatible Epson T3471 (34XL) Black. Replaces Epson T34XL Golf Ball Cartridges. Premium Compatible Epson T3472 (34XL) Cyan. Premium Compatible Epson T3473 (34XL) Magenta. Premium Compatible Epson T3474 (34XL) Yellow. Epson WorkForce Pro WF-3720 is designed to complement a home office or small office environment. It is a 4-in-one compact inkjet printer that delivers professional quality text, even remotely. With a weight of 8.6 kgs and measurement of 425‎ x 378 x 249 mm (Width x Depth x Height), it is a space-saving multifunction device. It has an integrated 6.8 cm colour touchscreen that enables users to control the functions smoothly. The text and photo quality of the 4-in-one is excellent. It prints black and white documents speedily at 20 ppm and colour at 10 ppm. A large 250-sheet main paper tray works fine for a heavy workload. A 35-page ADF and automatic duplexing facility add to quick and easy operation. It supports XL size Epson WorkForce Pro WF-3720 ink cartridges that are cost-effective in the long-term. User needs to replace only the cartridge that runs out. Connectivity of the device is versatile as it offers supports high-speed USB, WiFi Direct, Ethernet and NFC. Epson mobile apps make it possible to print and scan from anywhere. The printer is compatible with Windows and Mac PCs. Epson WorkForce Pro WF-3720 offers all the functions that are essential for a small office or home office users. The high-capacity compatible Epson WorkForce Pro WF-3720 ink cartridges can make the operations more affordable. This printer is a good pick for small business users who need to use the device on a regular basis. Q. Does this Epson WorkForce Pro WF-3720 printer supports Alexa printing? A. Yes, this printer is flexible with hands-free voice-activated printing options. One can print a variety of creative projects and everyday documents. Q. Does the printing speed of this Epson printer is reduced while printing over a network? A. The printing speed may vary a bit, but average speed remains constant, i.e. 20 ppm for grayscale and 10 ppm for colour. Q. What is the shelf life of the Epson WorkForce Pro WF-3720 Ink Cartridges? A. Depending on the environmental conditions, the shelf life of the ink cartridges may vary. If the cartridges are stored properly in a cool and dry place, then ideally it is 6 months. Q. I have recently installed my compatible Epson WorkForce Pro WF-3720 ink cartridges in my printer. But now "missing ink cartridges" error message is displayed. What can be the possible reasons? Make sure that colour of the ink cartridges matches with colour on the ink unit. Q. Can I expect a business quality print with a high printing speed from this Epson printer? A. Yes, of course! This printer has an optimum printing speed with a good printing resolution of 1200 x 2400 dpi. This printer is perfect for high-quality, crisp output. Q. I purchased Epson WorkForce Pro WF-3720 ink cartridges from your site and found it faulty. How can I replace my order? A. Fill the form to replace the order. Our team will contact you soon and replace the order. Make sure that you have your order ID available to you. Q. 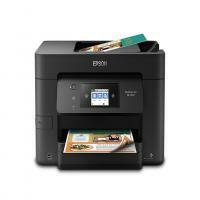 Does this Epson printer provide borderless prints? A. Yes, this printer provides borderless prints of sizes 4" x 6", 5" x 7", 8" x 10", Letter, A4, 16:9 wide (4" x 7.11").